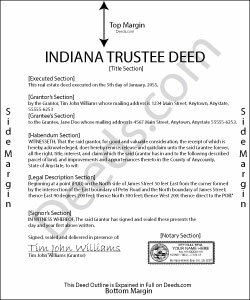 Trustees use this form to transfer real property located in Indiana out of trust, with warranties of title as set out in Ind. Code 32-17-1-2. The deed should be executed by the trust's acting trustee(s). A trustee's deed is an instrument used in trust administration to convey real property out of a trust. Unlike other forms of conveyance, which are named for the type of warranties they carry, the trustee's deed is named after the executing trustee. The trustee is the administrator of a trust who is appointed by the settlor. The settlor is the person who funds the trust with assets -- in this case, real property. The settlor executes a trust instrument, which contains the provisions of the trust, including a designation of the trust's beneficiaries. This document is generally not of public record. The trustee serves as the grantor in the trustee's deed. If there are multiple trustees or the trustee appears as a successor, this information is included also. The settlor does not enter directly into the transaction. In addition, the deed states the trust name and date under which the trustee is appearing, as well as any amendments made to the trust instrument. All instruments of conveyance in Indiana require a legal description of the property begin conveyed, the grantee's information, and the root of title, as well as a "prepared by" statement and affirmation statement regarding the redaction of Social Security Numbers. All acting trustees must sign the deed in the presence of a notary public before the deed is recorded in the county in which the real property is situated. Because trustees act in a fiduciary capacity, they may be asked to provide a certification of trust, demonstrating that the trust exists and their authority to enter into transactions on behalf of the trust. The trustee's deed may require additional information depending on the situation. These instruments may or may not include warranties of title, so make sure to use the correct form for the situation. Consult a lawyer with specific questions or guidance in preparing a trustee's deed. Maryel T. said: Good site, had the information I needed. Quicker than I expected. Thanks. Ellen d. said: Wonderful tool to have available on line! Gene L S. said: Exactly what I needed, at a reasonable cost. Reply from Staff: Thank you Gene.